The Triangular Fibrocartilage Complex is the ligamentous and cartilaginous structures that separate the radiocarpal from the distal radioulnar joint. The TFCC consists of an articular disc, meniscus homologue, ulnocarpal ligament, dosal & volar radioulnar ligament and extensor carpi ulnaris sheath. Tenderness on Palpation: The TFCC is located between the os pisiform, the ulnar styloid and the FCU. The best way to palpate the TFCC is with the wrist in pronation. Foveal Tenderness: difficult to distinguish from ECU tenderness  *TFCC Compression: A combination of ulnar deviation and axial compression while performing repetitive flexion and extension will have an impact on the ulnar styloid and the TFCC. If the TFCC is involved, this test will bring along pain and/or clicking. Press Test: The patient has to lift himself out of a chair, with the wrists in extension. This will cause pain. Supination test: The patient has to ‘lift’ the examination table, with the palmar side of the hand on the underside of the table. This will cause dorsal impingement, as it forces a load on the TFCC with the wrist in supination and extension. It is therefore useful in the diagnosis of a peripheral, dorsal TFCC tear. Piano-Key Test: The patient has to place both his hands on the examination table, while pressing the palms on the table. When there is an exaggerated dorsal-palmar translation in comparison with the other hand, this indicates DRUJ instability, which often comes with a TFCC tear. The piano-key test shows a positive result if the ulnar head returns to its normal anatomic position when the force is removed from the ulnar head, there is a difference in mobility and pain compared to the uninvolved side. Grind Test: The patient has to perform a rotation of the forearm, while the radius and ulna are compressed. This test might indicate degeneration. Trampoline Test: We will probe the TFCC to assess the tension. When there is no normal bounce, there might be a peripheral tear of the TFCC. TFCC Stress Test: This is a provocative test. The patient has the wrist in ulnar deviation while applying a shear force across the ulnar complex of the wrist. The rehabilitation program has to consist of rest, activity modification to remove the inciting force of injury, ice application and splint immobilization for 3 to 6 weeks. A TFCC tear is a common injury in golf, boxing, tennis, waterskiing, gymnastics, pole vaulting and hockey. Golf players and tennis players who suffer from a stable TFCC tear are able to start light activity ball contact at 3 weeks after the arthroscopy. They can return to their normal sports activity in 4 to 6 weeks. For more severe injuries an invasive solution has to be found. Post-operative immobilization in a Muenster cast for 4 weeks. After 4 weeks the wrist is placed in a short arm splint or Versa wrist splint, which allows progressive motion to the wrist. The immobilization will decrease the wrist pain and the aggregation, which could improve the healing environment. Some types of splints will help stabilize the wrist, which will lead to an improved hand function. () The patients can then start with range of motion and grip-strengthening exercises. () Therapists are more likely to give eccentric grip strengthening exercises, because this will have an influence on the co-activation pattern of the wrist-flexors, which will help stabilize the wrist. (,) Other co-activation exercises can also be included to improve the global wrist stability. () It is a fact that the grip strength decreases after an arthroscopy. A study has shown that grip strength was, on average, only 67% of the strength of the contralateral side. Patients often reported difficulties with grip activities as a functional problem, which has influence on self-care and ADL. They are likely to resume normal activity by 3 months postoperatively. - To promote the wrist flexion we used the dorsal sliding technique. - To promote the wrist extension we used the volar sliding technique. - To promote the radial deviation we used the ulnar sliding technique. - Horizontal ulnar and radial deviation. - Active pro- and supination. - Stretching flexion and extension of the wrist. At the end of the therapy we move on to strengthening exercises. 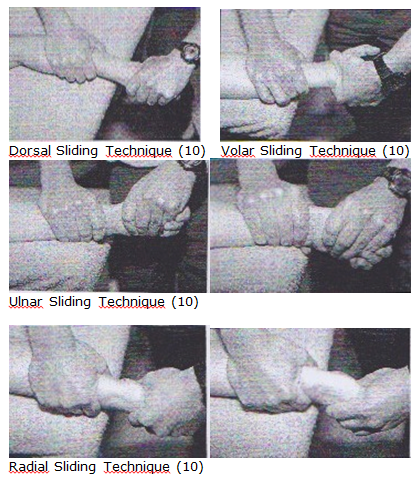 The following exercises are all done with a weight in the hands or with a terra tire (). ulnar extensor muscle tendinitis or subluxation. Lubiatowski P, Romanowski L, Spławski R, Manikowski W, Ogrodowicz P. Treatment of injury of the triangular fibrocartilage complex (TFCC). Ortop Traumatol Rehabil. 2006;8(3): 256-262. The triangular fibrocartilage complex (TFCC) supplies stability and cushioning for proper wrist function. TFCC lesions, a common cause of ulnar-sided wrist pain, can be traumatic (Palmer I) or degenerative (Palmer II) in nature. Clinical assessment is basic for making the diagnosis, but imaging may be helpful. Conservative treatment is the best choice for most acute cases. If the symptoms persist, however, operative treatment has a better prognosis for pain relief. Wrist arthroscopy has a major role to play in the diagnosis and treatment of TFCC lesions. Material and methods. 29 patients were operated in the Hand Surgery Department in Poznań due to TFCC lesions. 16 patients were qualified as Palmer type I (9 sport injuries, 7 sprains). while 13 patients had Palmer type II secondary to distal radial fractures. All patients suffered ulnar wrist pain and were positive on provocation tests. The indication for surgery was a lack of response to conservative treatment. Different operative procedures were used, depending on the type of lesion: arthroscopic debridement, open or arthroscopic restabilization of the TFCC, ulnar shortening, or partial resection of the ulnar head (Wafer). Rehabilitation was introduced following a period of immobilization. Results. Wrist pain was significantly diminished or disappeared after surgical treatment and rehabilitation. Conclusions. Good functional result and pain relief can be expected following surgical treatment of TFCC injuries. Chloros GD, Wiesler ER, Poehling GG. Current concepts in wrist arthroscopy. Arthroscopy. 2008;24(3):343-354. The purpose of this article is to review the recent literature on arthroscopic treatment of distal radius fractures (DRFs), triangular fibrocartilage complex injuries, intercarpal ligament injuries, and ganglion cysts, including the use of electrothermal devices. A major advantage of arthroscopy in the treatment of DRFs is the accurate assessment of the status of the articular surfaces and the detection of concomitant injuries. Nonrandomized studies of arthroscopically assisted reduction of DRFs show satisfactory results, but there is only 1 prospective randomized study showing the benefits of arthroscopy compared with open reduction-internal fixation. Wrist arthroscopy plays an important role as part of the treatment for DRFs; however, the treatment for each practitioner and each patient needs to be individualized. Wrist arthroscopy is the gold standard in the diagnosis and treatment of triangular fibrocartilage complex injuries. Type 1A injuries may be successfully treated with debridement, whereas the repair of type 1B, 1C, and 1D injuries gives satisfactory results. For type 2 injuries, the arthroscopic wafer procedure is equally effective as ulnar shortening osteotomy but is associated with fewer complications in the ulnar positive wrist. With interosseous ligament injuries, arthroscopic visualization provides critical diagnostic value. Debridement and pinning in the acute setting of complete ligament tears are promising and proven. In the chronic patient, arthroscopy can guide reconstructive options based on cartilage integrity. The preliminary results of wrist arthroscopy using electrothermal devices are encouraging; however, complications have been reported, and therefore, their use is controversial. In dorsal wrist ganglia, arthroscopy has shown excellent results, a lower rate of recurrence, and no incidence of scapholunate interosseous ligament instability compared with open ganglionectomy. Arthroscopy in the treatment of volar wrist ganglia has yielded encouraging preliminary results; however, further studies are warranted to evaluate the safety and efficacy of arthroscopy. Henry MH. Management of acute triangular fibrocartilage complex injury of the wrist. J Am Acad Orthop Surg. 2008;16(6):320-329. Acute trauma to the triangular fibrocartilage complex includes tears of the fibrocartilage articular disk substance and meniscal homolog as well as radioulnar ligament avulsions, with or without an associated fracture. Patient evaluation includes clinical examination, imaging studies, and wrist arthroscopy (diagnostic). The Palmer classification is typically used to define injuries to the triangular fibrocartilage complex. The critical distinction is in differentiating injuries that produce instability of the distal radioulnar joint from those that do not. Also important is the recognition of acute injuries in the context of an ongoing degenerative pattern (ie, Palmer class 2 lesions). Nonsurgical management includes temporary splint immobilization of the wrist and forearm, oral nonsteroidal anti-inflammatory medication, corticosteroid joint injection, and physical therapy. Surgical strategies include debridement, acute repair, and subacute repair. Most surgical procedures can be performed arthroscopically. However, open ligament repair may be needed in the setting of distal radioulnar joint instability. Albastaki U, Sophocleous D, Göthlin J, Pierre-Jerome C. Magnetic resonance imaging of the triangular fibrocartilage complex lesions: a comprehensive clinicoradiologic approach and review of the literature. J Manipulative Physiol Ther. 2007;30(7):522-526. OBJECTIVE: This article illustrates the frequent lesions of the triangular fibrocartilage complex (TFCC) by means of magnetic resonance imaging. METHODS: We performed a retrospective chart review of the magnetic resonance images of 109 patients from our database. All subjects had history of trauma, and all underwent both radiographic and magnetic resonance imaging examination of the wrist. The changes (degeneration, tears) of the TFCC were assessed. RESULTS: Ten patients were excluded because of incomplete imaging protocol (4 patients) and low-quality images (6 patients). From the 99 wrists remaining, the TFCC was normal in 30 (30.3%). Degenerative changes were found in 40 (40.4%) wrists. Partial and complete tears were present in 17 (17.1%) and 12 (12.1%) wrists, respectively. CONCLUSION: The TFCC lesions in acute traumatic wrists should not be overlooked; they may contribute to wrist pain and disability after treatment of existing bone injuries. ↑ Verheyden JR, Palmer AK. EMedicine. Triangular Fibrocartilage Complex. http://emedicine.medscape.com/article/1240789-overview. (accessed 25 June 2009). ↑ 2.0 2.1 Wheeless CR. Wheeless' Textbook of Orthopaedics. Triangular Fibrocartilage Complex. http://www.wheelessonline.com/ortho/triangular_fibrocartilage_complex (accessed 25 June 2009). ↑ UK Orthopaedic Surgery & Sports Medicine. Health in Sports Report-Issue 6: Triangular Fibrocartilage Complex (TFCC) Injury. http://ukhealthcare.uky.edu/sportsmedicine/health_in_sports/issue6.asp (accessed 25 June 2009). ↑ Verheyden JR, Palmer AK. EMedicine. Triangular Fibrocartilage Complex. http://emedicine.medscape.com/article/1240789-treatment (accessed 25 June 2009). ↑ Reiter A, Wolf MB, Schmid U, Frigge A, Dreyhaupt J, Hahn P, et al. Arthroscopic repair of palmer 1B triangular fibrocartilage complex tears. Arthroscopy. 2008;24(11):1244-1250. ↑ Estrella EP, Hung LK, Ho PC, Tse WL. Arthroscopic repair of triangular fibrocartilage complex tears. Arthroscopy. 2007;23(7):729-737. ↑ Prof. Dr. R. Meeusen, Praktijkgids pols- en handletsels, VUB, p131-151. ↑ ↑ Verheyden JR, Palmer AK. EMedicine. Triangular Fibrocartilage Complex. http://emedicine.medscape.com/article/1240789-treatment (accessed 25 June 2009). ↑ Ahn AK, Chang D, Plate AM. Bulletin of the NYU Hospital for Joint Diseases. Triangular Fibrocartilage Complex Tears: a Review. http://findarticles.com/p/articles/mi_6806/is_3-4_64/ai_n28439298/?tag=content;col1 (accessed 25 June 2009).